Please click the categories below to assist you! The City of Trenton has nonpartisan elections, which means that candidates do not run as political party candidates. There are no primary elections for city offices, but there can be run-off elections if no candidate receives a majority of votes cast. The election is Tuesday, May 13, 2014. If a run-off election is required, it will be held on Tuesday, June 10, 2014. If no candidate gets a majority of votes cast for mayor or each ward council position, then the run-off election will be between the two candidates for each position with the greatest number of votes. For at-large council positions, the rules are more complex. If at least one at-large candidate receives a majority of votes cast, then the three candidates receiving the greatest number of votes are elected. Since we vote for three at-large council positions, it is possible for more than one candidate to receive a majority of votes cast. But if no candidate for the at-large council positions receives a majority of votes cast in the May 13 election, then on June 10 there will be a runoff among the six candidates who received the greatest number of votes. If a run-off election is required, then the three candidates for the at-large positions who receive the greatest number of votes at the run-off election are elected. If you are in college, you have the option to register from your college address or your parent’s address. There are good reasons for registering and voting at either residence, but keep in mind, the final choice is yours. You will receive a sample ballot about 1 week before the election that will indicate where your polling place is. If you would like to find out if you are registered to vote in your county you can find out here. NOTE: The registration deadline to vote at the next election is 21 days prior to election day. What do I need to bring when I vote? Polling stations are open from 6AM to 8PM. Polling stations are open from 6AM to 8PM.This is an interactive map of all the polling locations in Trenton. You can drag it, zoom in and out, and click on markers for more information or directions. Red markers indicate polling locations for the North Ward, blue for South Ward, purple for West Ward, and yellow for East Ward. Your assigned polling location is shown on a sample ballot you will or have already received in the mail, but if you are still unsure where to go you can contact the Office of the City Clerk at 609-989-3187. *The map may need a few moments to fully load. What if I need an absentee ballot? Under Election Law Enforcement Commission regulations, “street money” can only be paid by check, and the candidate or committee must report the date, check number, name of the recipient, date, and the amount and purpose of the payment. There are legitimate purposes for street money, such as get-out-the-vote efforts and poll watching or challenging. However, any payment for inducing a voter to vote for or against a candidate is a crime. You can vote for one of the candidates running the Ward in which you are registered to vote, and can vote for three “at large” candidates. 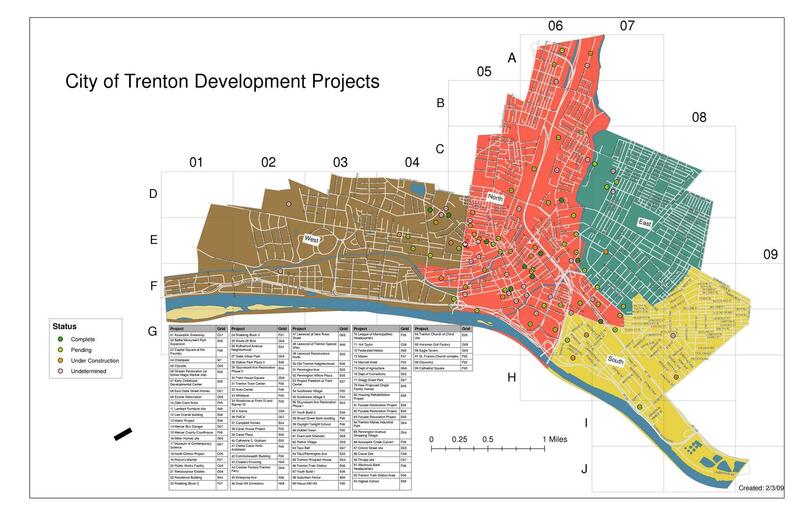 Trenton is divided into four wards–North, South, East, and West–and this map shows each of the wards.How many of the “at-large” candidates for City Council can I vote for? We elect three council members at large (on a city-wide basis), so you can vote for three council members. Many voters make the mistake of voting for only one at large candidate–in the May 11, 2010 election on average each voter cast a vote for two candidates, but could have voted for three. A total of 20,808 votes for at large candidates were cast by 11,035 voters, resulting in an undervote (or failure to vote) of 11,705 votes. But you can only cast one vote for any at-large candidate.